Want to play along with the Wicked Wednesday challenge? I hope you will. Make your ATC and link it up at the challenge and you could win fabulous Bugaboo images. And don't NOT play along because it's an ATC challenge. 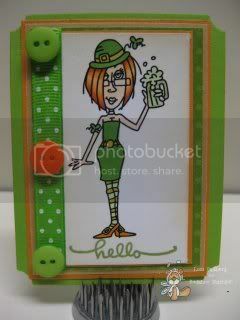 ATCs make great focal points for cards so you can make an ATC now and then use it on a card later! I can't believe I've never made an ATC before! This is wonderful. :) One of my favorite holidays for the celebratory meal. Perhaps I'll throw in another tradition and start making ATCs. Thank you for the beautiful inspiration, Lori and thank you also for sharing with us at Make It Monday. What a lovely ATC project! Thank you for joining in at Creative Mondays! JJ is a hoot and you spotlighted her perfectly for the occasion and I saw this cute card at MIM...hummm I should had seen it sooner....sorry about that. Hi Lori, I came over from MIM to take a closer look at your gorgeous card! Cute image and so green!